In just 15 short weeks at the Academy of Beauty Professionals, you’ll be ready to launch your career as a professional nail technician! The nail technology program is designed to help our students achieve new goals and skills in the most efficient way possible, so they can graduate in a short amount of time and enter into a creative and rewarding career! The foundation of our nail technology program is based on three segments: theory, practical, and professional. Theory serves as the foundation of your education. This is where you will learn about the art and science of being a successful nail artist. In the practical segment, you will begin to perform services on clients in a salon setting. This is where you will master the skills to confidently pamper your clients. In the professional segment you will learn everything from client retention to the skills required to manage your own salon! Each phase of the nail technology program will focus on a different combination of all three segments. With the combination of theory and practical hands-on training on real clients, you will graduate from our nail technology program more marketable and ready for employment in the beauty industry! INTERESTED IN LEARNING MORE ABOUT OUR NAIL TECHNOLOGY PROGRAM? Connect with us. Our nail tech program is offered at various times throughout the year. We also offer different payment plans for the program. We’d love to chat about your interest and show you around the Academy of Beauty Professionals! 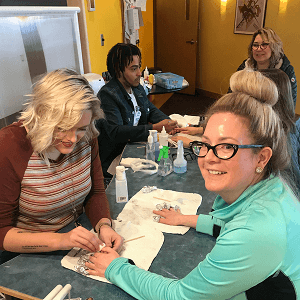 To get an idea of what our nail technology program is like, read what our past nail technology students had to say about ABP in our blog.